Cross section through ebola virus shows proteins in blue, green and magenta, the RNA genome in yellow, and the membrane in light purple. Atomic structures are shown on the right, with portions that have not been determined shown with schematic circles. The genome of ebola virus contains instructions for building seven proteins, which assemble with the genomic RNA to form one of the deadliest viruses. 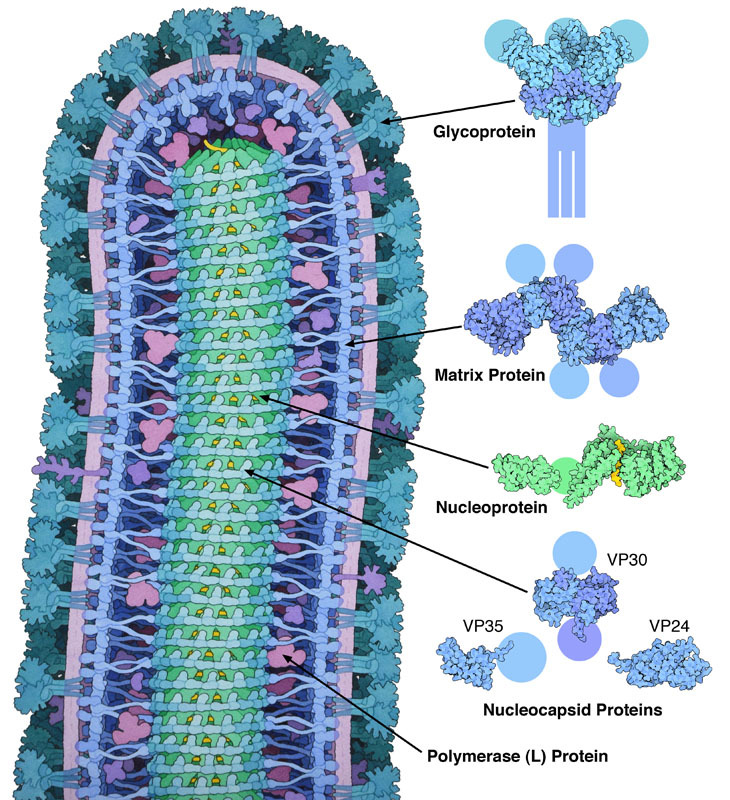 Ebola virus is surrounded by a membrane stolen from an infected cell, and studded with ebola glycoproteins. A layer of matrix proteins support the membrane on the inside, and hold a cylindrical nucleocapsid at the center, which stores and delivers the RNA genome. 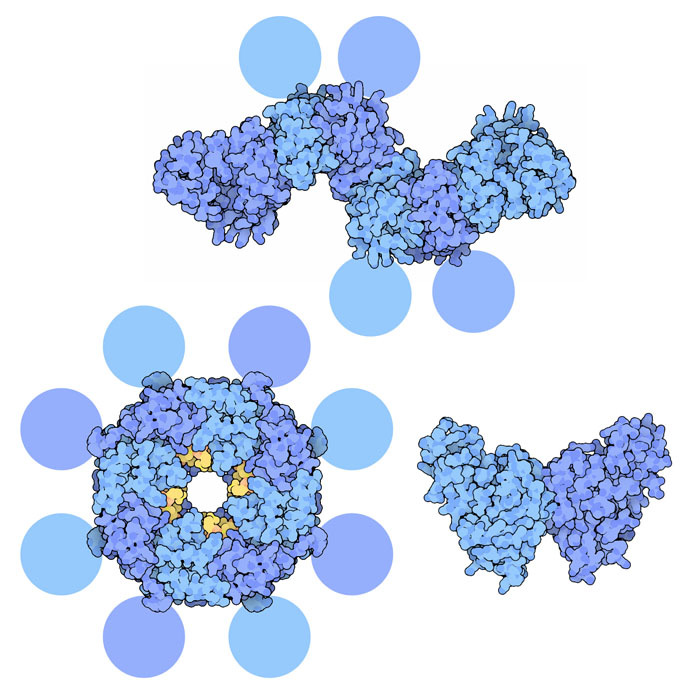 The ebola glycoprotein has the task binding to receptors on a cell surface and getting the ebola genome inside. It shares many of the features of other viral fusion proteins, such as influenza hemagglutinin and HIV envelope glycoprotein. It extends from the surface of the virus, and is covered with carbohydrate chains that hide it from the immune system. It is also a highly dynamic protein that snaps into a different shape when it binds to a cell surface, dragging the virus and cell close enough to each other that the membranes fuse. 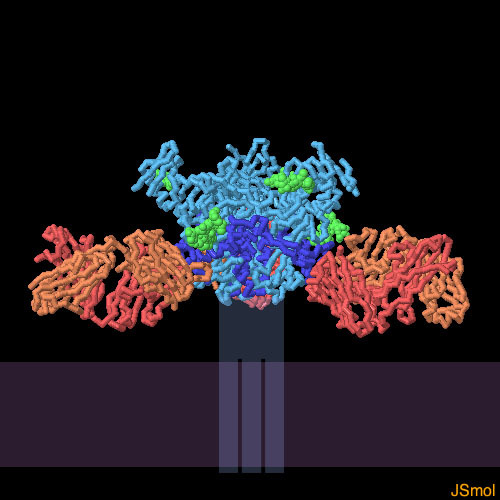 The structure shown here (PDB entry 3csy ) includes the receptor-binding portion of the glycoprotein and the machinery for membrane fusion. To allow cystallization, a small domain has been removed that includes much of the carbohydrate that normally covers the glycoprotein. Ebola matrix protein, also known as VP40, shapes the virus and drives the process of budding. Many copies of the protein associate on the membrane, and are thought to make connections both to the membrane and to the nucleocapsid. The structure shown here (PDB entry 4ldd ) is a hexamer of subunits. A domain at the end of each chain is connected through a flexible linker--so flexible that four of them were not clearly seen in the crystallographic structure because they were moving so much. Helical complex of nucleoprotein (green) and RNA (yellow). At the center of the virus, a nucleocapsid composed of several types of proteins protects the genome. The ebola nucleoprotein wraps around the RNA, creating a helical complex. 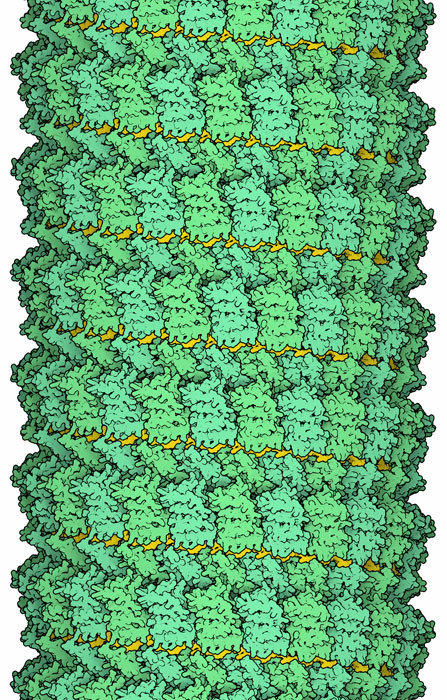 The interaction between nucleoprotein subunits, however, is not as rigid as in other viruses such as tobacco mosaic virus, so ebola virus often shows a wavy structure. Once inside cells, the large "L" protein, which is an RNA-dependent RNA polymerase, creates many new copies of the RNA genome. Different states of the ebola matrix protein, with bound RNA in yellow. Since viruses only have room in their small genomes to encode a few proteins, these viral proteins often moonlight in several jobs apart from their main task. The matrix protein of ebola is particularly unusual because it adopts entirely different structures for its different jobs: as a hexamer in the virion structure (PDB entry 4ldd ), as an octamer that binds to RNA and regulates viral transcription (PDB entry 1h2c ), and as a dimer involved in transport of the protein (4ldb ). Researchers are looking hard for ways to fight infection by ebola, both with drugs and with vaccines. The glycoprotein is the major target for vaccines, since it is on the surface of the virus and is accessible to antibodies. The structure shown here, PDB entry 3csy , includes neutralizing antibodies (in red and orange) from a person who survived infection by the virus. The antibodies bind to the underside of the glycoprotein, to a portion of the protein that is not usually masked by carbohydrates and that is essential for the process of fusion. Hopefully, vaccines will be able to elicit these types of antibodies in patients, protecting them from infection. To explore this structure in more detail, click on the image for an interactive JSmol. Entry 3csy is thought to be the ebola glycoprotein before it binds to a cell surface. You can look at entry 2ebo to see a portion of the glycoprotein after it fuses with the cell. 5z9w: Y. Sugita, H. Matsunami, Y. Kawaoka, T. Noda & M. Wolf (2018) Cryo-EM structure of the Ebola virus nucleoprotein-RNA complex at 3.6 angstrom resolution. Nature 563, 137-140. 4qb0: P. J. Dziubanska, U. Derewenda, J. F. Ellena, D. A. Engle & Z. S. Derewenda (2014) The structure of the C-terminal domain of Zaire ebolavirus nucleoprotein. Acta Crystallographica Section D 70, 2420-2429. T. F. Booth, M. J. Rabb & D. R. Beniac (2013) How do filovirus filaments bend without breaking? Trends in Microbiology 21, 583-593. 4ldb, 4ldd: Z. A. Bornholdt, T. Noda, D. M. Abelson, P. Halfmann, M. R. Wood, Y. Kawaoka & E. O. Saphire (2013) Structural rearrangement of ebola virus VP40 begets multiple functions in the virus life cycle. Cell 154, 763-774. 3csy: J. E. Lee, M. L. Fusco, A. J. Hessell, W. B. Oswald, D. R. Burton & E. O Saphire (2008) Structure of the ebola virus glycoprotein bound to an antibody from a human survivor. Nature 454, 177-182. 3vne: A. P. P. Zhang, Z. A. Bornholdt, T. Liu, D. M. Abelson, D. E. Lee, S. Li, V. L. Woods & E. O. Saphire (2012) The ebola virus interferon antagonist VP24 directly binds STAT1 and has a novel, pyramidal fold. PLoS Pathogens 8: e1002550. 3fke: D. W. Leung, N. D. Ginder, D. B. Fulton, J. Nix, C. F. Basler, R. B. Honzatko & G. K. Amarasinghe (2009) Structure of the ebola VP35 interferon inhibitory domain. Proceedings of the National Academy of Science USA 106, 411-416. 2i8b: B. Hartlieb, T. Muziol, W. Weissenhorn & S. Becker (2007) Crystal structure of the C-terminal domain of ebola virus VP30 reveals a role in transcription and nucleocapsid association. Proceedings of the National Academy of Science USA 104, 624-629. 1h2c: F. X. Gomis-Ruth, A. Dessen, J. Timmins, A. Bracher, L. Kolesnikowa, S. Becker, H. D. Klenk & W. Weissenhorn (2003) The matrix protein VP40 from ebola virus octamerizes into pore-like structures with specific RNA binding properties. Structure 11, 423-433.